Random fact: I like to rock climb. Fern spent time in several departments at InterAmerican and joined the “green side” in 2007, after quickly learning the ropes. She immediately impressed the team with her ability to complete her daily tasks—and produce espresso drinks with beautiful latte art for everyone in the office! In 2008, Fern represented the first importer to compete in a barista competition, and for years she kept in touch with her “inner barista” by judging and volunteering for competitions in the United States and Mexico. 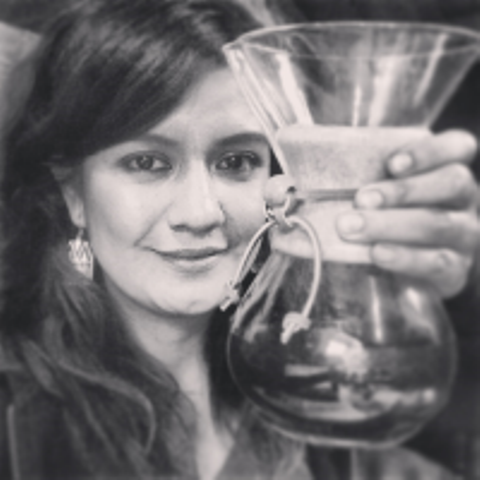 She is also Q Certified and has participated as a cupping and green-grading judge for Rainforest Alliance. Fern is responsible for InterAmerican’s West Coast traffic department, ensuring our coffee shipments make it safely from warehouses to roasting plants around the world. Bilingual in Spanish and English, Fern is a huge asset to our team and is able to communicate well with our origin partners as well as connect with roasters and baristas. She has had the opportunity to visit farms in Costa Rica and is always up for a coffee adventure! Favorite coffee memory: I competed in 2008 and remember feeling so nervous. I wore high-heel boots that day, and one of the judges knocked off points for wearing non-coffee-making type of shoes. LOL!